Vitiligo is a condition which involves complete loss of melanin, the primary skin pigment. The cause of vitiligo is unknown but it appears to be an acquired condition and may appear at any age. The resulting lesions are white in comparison to the surrounding skin. 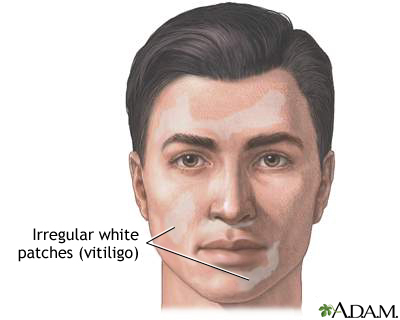 Vitiligo may occur in the same areas on both sides of the face or it may be patchy. The typical vitiligo lesion is flat and depigmented, but maintains the normal skin texture.